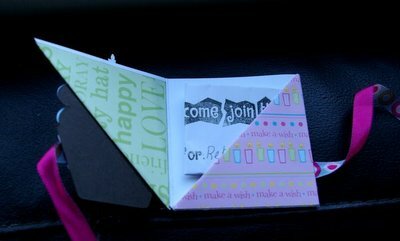 A few scraps + a few minutes = a great little gift card holder ! Why give a gift card in a daggy production-line card when you can make something special in just a few minutes ? I've just made this cute little gift card holder (ok, my example is a fake credit card LOL) from left over scraps of paper from a layout I did last week using papers from the Max's Backyard range. 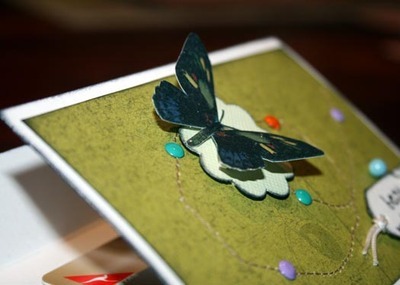 I cut the butterfly from 'Sparkle Butterfly Garden' paper and popped its wings up with Fiskars Foam Dots; the background paper is 'Bee Shadows'; and the tag was made with the 'Tag, You're It" squeeze punch. The white lattice strip on the top was made with the 'Lattice Entertain You' corner border punch. The following products will all be available in Spotlight stores in Australia & New Zealand from September 2008. As a mother of three boys, I sometimes find it difficult to find papers that are geared for boys. So I'm just loving Max's backyard by Cloud 9. Its so boyish. Here's a layout using Max's Backyard. Just to put the record straight...they are NOT my sons real ears, His wearing plastic ones he got from the circus. 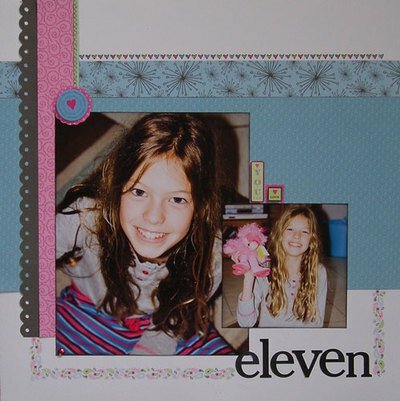 The tag on this layout was made using the Ultra Shape Express with the rectangle template. 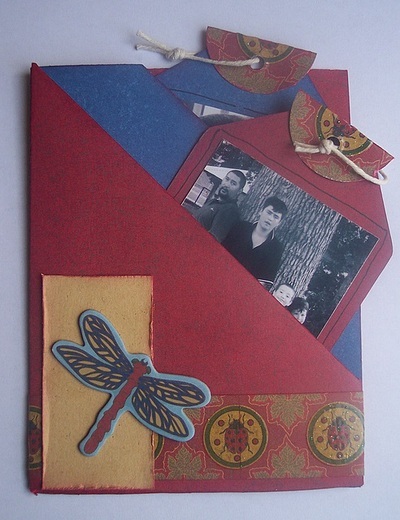 This tag folder is also using Max's backyard, the folder is made from "Butterfly Shadows" my favorite patterned paper from the line. The red and blue look soooooo good together. Sun + Summer + Fun = Backyard Luau time! 1. Use Hibiscus specialty paper as a "mask" - adhering it to the backside (color: yellow) of the Sundrenched 12x12 patterned paper. Sponge in red ink through the flower diecuts in the Hibicus paper, and also along the paper's outer edge. Remove the Hibiscus "mask" and trim Sundrenched paper along the image that the inked Hibiscus paper created. 2. Trim a strip of the Calliope patterned paper at least 2" wide and X" long (X measuring the distance cut from the Sundrenched paper). Use your fine tip scissors to create a paper fringe along the length of the strip. Adhere to the decoration. 3. Finish off by creating a greeting (Aloha!) using a combination of chipboard alphabets and letter rub-ons. 1. This project is super easy. To create the napkin rings, simply trim cardstock to .5" x 6". Roll up and use tape to adhere roll closed. 2. Adhere a decorative brad threaded through a cardstock sticker atop a Invisible Blossom to the rolled up cardstock. Voila! You've just created a napkin ring. 3. Add a finishing touch by personalizing each napkin ring with the initials of your guests. Rub a letter rub-on on atop a label sticker. Attach this "tag" to the napkin ring using thin twine. 1. Use a computer document program to write out either your (a) invitation or (b) party menu and print on vellum. Make sure to leave enough space at the top to add decorative rub-ons. 2. Trim gradient cardstock (in this case I used the 12x12 paper Sundrenched) slightly thicker than that of the vellum, about .25" thicker on all sides. Adhere the printed vellum to the paper. 3. Finish off by using a combination of decorative rub-ons and letter rub-ons to create the title and embellishment for the invitation or menu. 4. For added flair, distress the edges of the vellum using a spongy stamping ink. 1. Trim specialty papers (Hibiscus and Rain Forest) to just half their width. These halves will act as the "crown" party hats. 2. Distress the edges of these crowns using stamping ink. 3. Create a decorative title for each hat using chipboard alphabets. 4. Tie ribbon to each end of the crown and join together, effectively creating a tropical themed party hat! It's almost August and that means if you live by a Lincraft store, you'll be able to purchase this gorgeous new Heidi Grace "Only Time" range soon. I love the double sided papers and with this range, the reverse side is gorgeous softly patterned pastel colours, while the front side is funky patterns - lots of circles and little clocks. very cool! 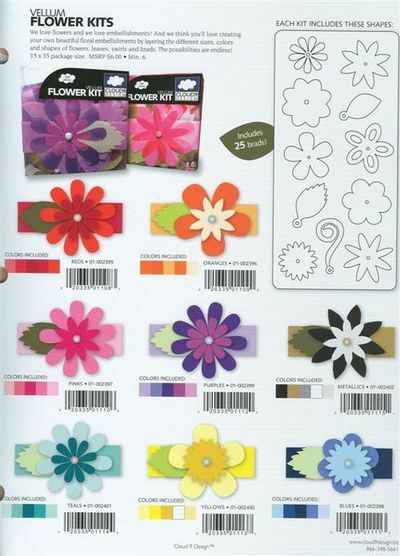 I've also used new ranges which will be available in Spotlight stores in September - the Cloud 9 Vellum flowers and Fiskars Border punches. If you click on the store logos to the right side of the blog, you'll get updates of new product releases and see images of the Fiskars punches. They are really awesome! You'll see from these images that I used a couple of techniques with the Vellum tape that comes in the box of Cloud 9 Flowers. I pleated the piece up the side of the photo, and snipped the tape at the bottom of the layout - easy with Fiskars scissors. 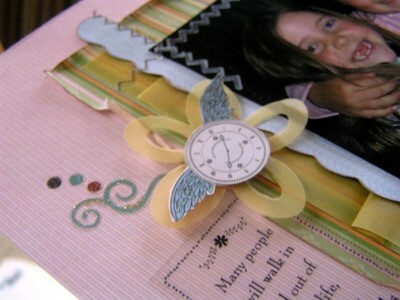 This photo also shows you the lovely pattern made with the Fiskars Circle Border punch. 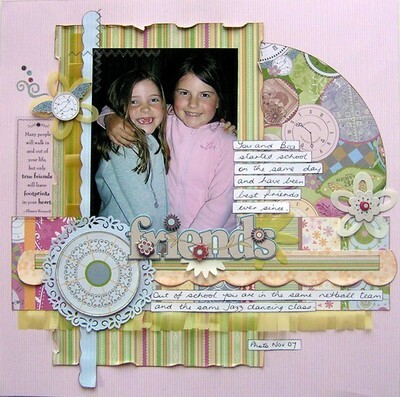 Paper and Clear Phrases sticker: Heidi Grace "Only Time"
Title & Rub ons: Cloud 9 "Cocoa Mint"
Punch: Fiskars Circle Border Punch "Antique Elegance"
Birthdays are ordinary days sprinkled with stardust. Once again we shall have a TEAM of our Fiskars Craft Ambassadors and Demonstrators offering advice on how to use the FISKARS TOOLS and offering FREE Make 'n' takes all day each day of the Show.......from 10am -5pm each day. 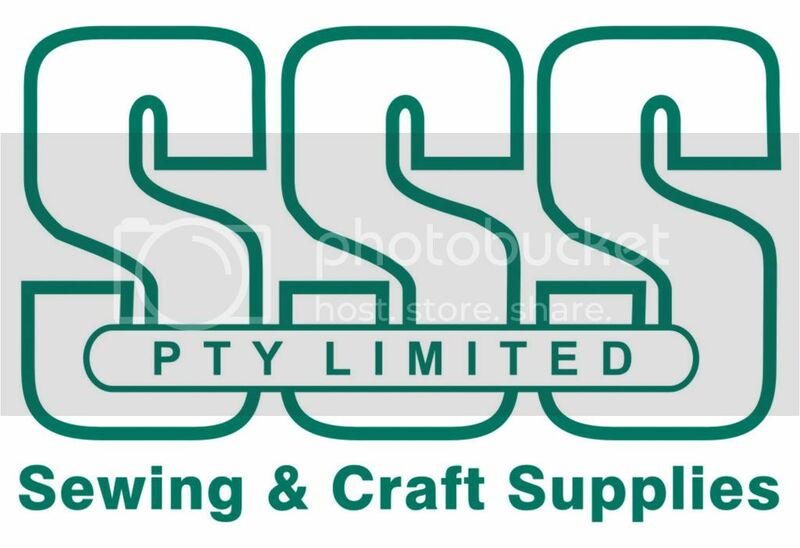 We shall have some of the Cloud 9 Max's Backyard Range of product for you all to play with along with some Mrs Grossman's Stickers......."Pen and Ink"......and we shall also have some Cloud 9 Vellum Flowers to play with.........a real Papercrafting Heaven!........and hey.....it's all FREE!! SO make sure you drop by in the Living Creatively Area.......the place where it all happens.....such fun! We shall be in the Garden Shed again as well as having tables in the Garden.......in fact we are going to offer an extra table for a couple of days and we know how popular these were in Brisbane.....so now we can have even more participants join in the PAPERCRAFTING FUN!! 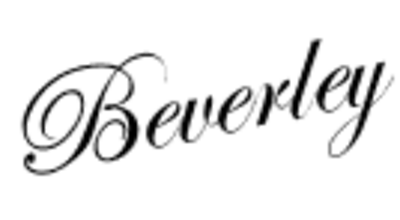 and that's not all........each day I shall be giving a LIVE STAGE PRESENTATION through the day......joined by one of our Sydney Ambassadors.......Jacky McLeod!SO we shall have a few giveaways during these Presentations....and "hands on" tool demonstrations with all the latest FISKARS TOOLS! You will also get to meet the following FISKARS CRAFT AMBASSADORS during the Show...........Lee Woodside, Lusi Austin AND Mishell Lancett........along with Eve Hawkes,Lorraine-Lee, Azza and Robyn Wilkinson! This team is very creative and talented and all the girls are looking forward to a great SHOW! My eldest daughter just turned 9 a few weeks ago. It seems the latest trend in party invitations is just a handwritten note or maybe a quick computer printed page loaded with clip-art. Of course, being the creative sort I am ... 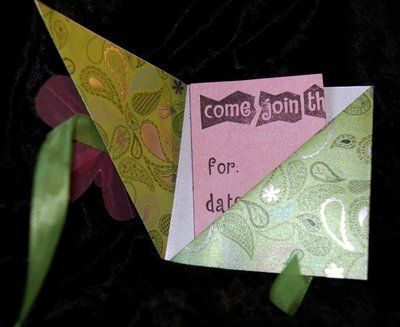 I didn't want to miss an opportunity to create a one-of-a-kind, party-specific, beautifully-matching invitation. So we compromised ... 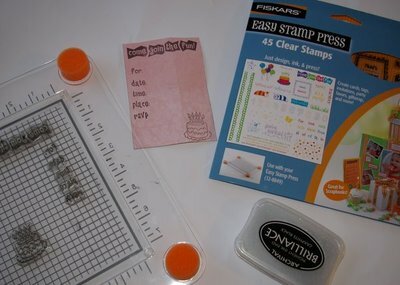 I pulled out some fiskars birthday clear stamps and set them up on my stamp press, then I gave Rebekah some paper and an ink-pad and left her to stamp and fill in the details. While she was stamping, I put together the outside of the invitations. When we were finished she folded up the details and slotted them in. We ended up with invitations we were both happy with ... a successful compromise I think! Her party was held at the hairdressers. They each had their nails painted and their hair styled, then we went out for a photo shoot ... I now have plenty of 'party' photos to scrapbook. 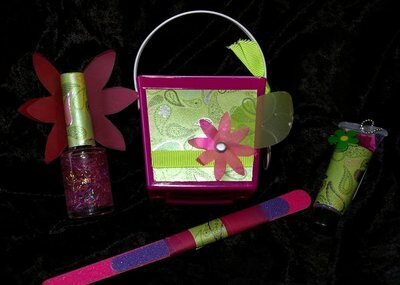 Each child received a mini noodle box filled with a nail polish, emery boards, hair glitter and of course topped up with lollies. I used some Shimmer Foiled Paper from the Heidi Grace A little Bird's Tale range to wrap around everything and make it all neatly matching and suitably pretty. I've also used some Cloud 9 vellum flowers. Speaking of perfectly matching ... here's an invitation I just made up with the left over papers - it's the same design as the cupcake ones but a better match to the take home gifts! I'm now on the lookout for ideas for 'boy' invitations ... it seems I've got a nearly 7 year old who wants an 'alien' party ... sounds like a good creative challenge to me! Two of my all time fave scrappers Ali Edwards + Celine Navarro have both blogged over the past couple of days about a Fiskars product that has inspired them. They are both really liking the Fiskars Scallop Threading Water Punch. You can see Ali's blog HERE and Celine's HERE. In honor of celebrating the arrival of four new paws to yours or your friend’s home, I have used a variety of my favorite Fiskars tools and mixed in my love for fabric, “Kraft” paper, Barn Red Cardstock, doodling and chocolate to create the perfect little ensemble of puppy treats! Whether you have a severe case of puppy love or have a new dog owner in the family, these projects are the perfect gift, for you or for the ones you love. 2. Trim a 3 x 5 puppy picture with Fiskars decorative edges scissors (I used a scalloped edge scissor, circa 1994!). Distress edges with sanding block to show detail of scalloped edges. 3. 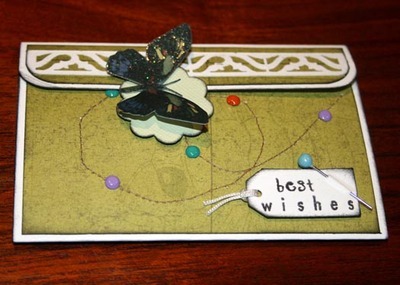 Cut 1 kraft cardstock scrap to 3 ¾ x 5 ¼ . 4. 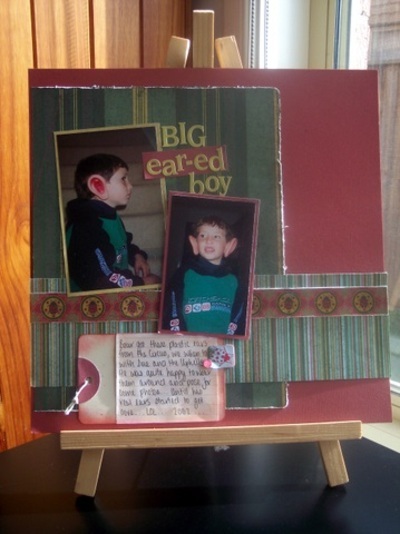 Cut 1 red cardstock scrap to 3 ½ x 5” . Layer red on top of kraft piece & adhere to each other. 5. Adhere puppy photo on top and adhere to front of journal. 6. Cut one piece of kraft cardstock to measure 3 ¾ x 1 1/8 & one piece of blue cardstock to measure 1 x 3 ¾. Adhere blue piece to kraft piece. 8. Using the USX, freehand letters to spell the name of the new puppy and one medium to large size heart (approx. 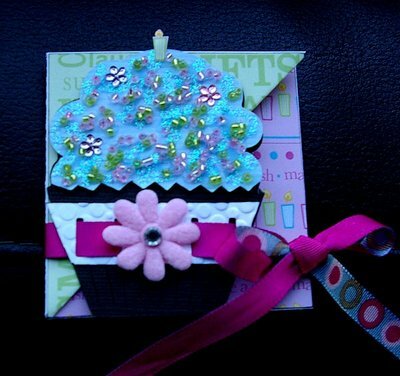 1 ½” tall) using scraps of red cardstock. 9. Arrange letters spelling out name and adhere to top of blue strip. Adhere heart to the right hand side of name with pop dot. 10. Using a fine tip black pen & a white pen, add in doodles & details. 11. Punch a paw print using the “Furry Friends” squeeze punch. Using a fine tip black pin, doodle in lines & dots to add extra detail. Adhere to corner of photo using pop dots. 1. Cut one piece of doggie patterned fabric measuring 5” x 15”. Fold right sides together and stitch ¼ - ½ seam up each side to create a “bag”. Prior to turning right sides out, trim top of bag with pinking shears. Turn right side out and iron if necessary. 2. Place the six dog bones into a cellophane bag and seal. Place into fabric bag and tie closed with jute, twine or ribbons. 1. Cut a piece of brown cardstock measuring 3 ¼” x 5”. Fold in ½ and trim with pinking shears. 2. Using the Ultra Shape Express & the Frames template, cut a small frame from blue cardstock and adhere to front of brown cards. 3. Using the USX freehand cut a doggie shaped bone & 1 red heart. TIP-Trace around a real doggie bone on tan paper to get the shape for cutting freehand! 4. 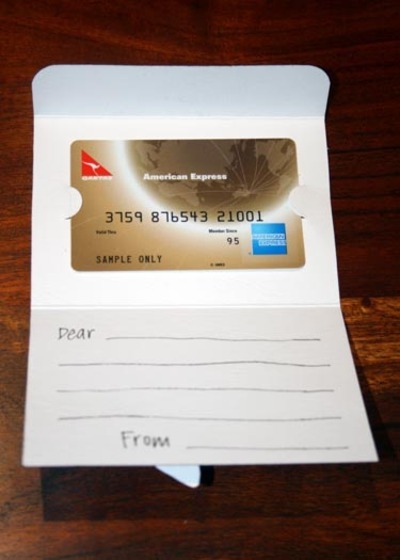 Adhere the dog bone onto the card and then the read heart. Use a black fine tip pen to add details & a white pen to add your greeting to the heart. 5. 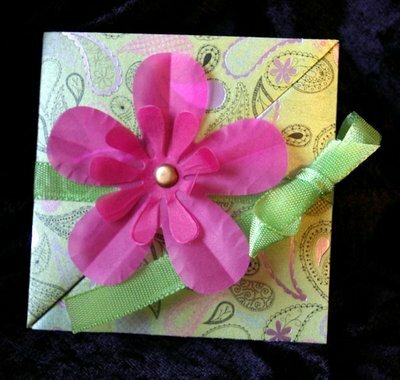 Punch a hole into the left hand upper corner of the card and tie onto jute/twine bag closure. 1. Place candy melts in a microwave dish and heat approx. 30 seconds. Stir and repeat in 10-second intervals until chocolate is melted. 2. Place cookie cutter on a piece of waxed paper on a solid surface. Pour melted chocolate into center of cookie cutter until ¾ full. Let set until chocolate has hardened. 3. Place filled cookie cutter into cellophane bag and tie bag closed Place into a small brown paper bag and fold top of bag over and punch two holes. 4. Cut a piece of gingham fabric measuring approx. 1 x 12, thread through holes in bag and tie into knot. Trim edges with pinking shears. 5. Create a little hanging tag using a piece of cardstock measuring 1 ½ x 2 ½. Cut a small tag using kraft cardstock & the USX Frames Template. Adhere to larger tag and embellish with a small USX freehand cut heart. 6. Add message & detail to tag, punch hole & tie onto gingham bow. 1. Using Fiskars pinking shears and same puppy patterned fabric as fabric bag, cut two strips measuring 2” x 12” and two strips using the gingham fabric from the chocolate bone. Set aside. 2. Create a paw print template by cutting a scrap piece of cardstock 4” x 4”. Punch a paw print in each corner of 4 x 4 square. 3. place a kraft handled gift bag on a flat & stable surface. Using acrylic or any kraft paint, place template on bag, hold into place with left hand and lightly sponge on or dab pint over entire four paws on template. Gently left template off of bag. NOTE: before you set your template down to repeat step, make sure that there is no excess paint on back of template. 4. Repeat paint steps until entire font panel of bag is covered. Let dry and repeat on opposite side of bag. 5. Wrap the puppy journal in tissue paper and place inside decorated bag. 6. Tie handles of bag together using 1 strip of fabric. Using a coordinating strip, overlap first strip and tie together. Repeat these steps until all fabric strips have been used. Trim strip ends with pinking shears making sure to alternate lengths [insert close up of fabric bow here].